PHILADELPHIA – Philadelphia Stories literary magazine and The Fairmount Park Welcome Center will present “Forgotten Philadelphia,” a new exhibition that runs from September 15 through November 9, 2012. The exhibit combines art inspired by specific heritage sites with poems and short fiction that speculate on the stories behind these hidden treasures. “Forgotten Philadelphia” explores hidden treasures from the Philadelphia area, from abandoned historic buildings to forgotten parks, through the work of local artists and writers. Melissa Tevere, Art Editor of Philadelphia Stories, selected the fifteen heritage sites represented in this exhibit from proposals sent by local artists. She based the final selection on the diversity of the site location, the diversity of the artists’ chosen medium of expression, and whether or not the site is in danger of disappearing, has been saved or its future is uncertain. Once the sites were chosen, they were assigned to local writers and poets selected by Carla Spataro, Editorial Director Philadelphia Stories, and Courtney Bambrick, poetry Editor. The writers and poets featured in this exhibit take a variety of approaches to interpreting these heritage sites. Some writers imagine stories of characters who may have experienced these sites as visitors or residents. Some poets chose literal reactions to the sites, some reflected on the sites more figuratively. The resulting exhibit presents a unique interpretation of these heritage sites through words and art. PS Books, the books division of Philadelphia Stories, will publish the collection this winter. 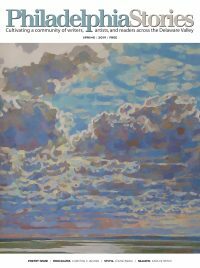 Philadelphia Stories is a non profit literary magazine, founded in 2004, that publishes the finest literary fiction, poetry and art from Pennsylvania, New Jersey, and Delaware and distributes free of charge to a wide demographic throughout the region. Our mission is to develop a community of writers, artists and readers through the magazine, and through education programs, such as writer’s workshops, reading series, and other affordable professional development programs for emerging writers and artists. Read the article about the exhibit at the Welcome Center in Philadelphia’s Love Park in THE METRO Here.